Perfect Fit : Specially designed for Apple iPhone 7 4.7 inch. Smart Clear View : The Clear View Flip Cover enables you to view the date, time and weather through the display window. Support intelligent wake up/sleep function. Kickstand Feature : Watching a movie or video on your phone has been made easier with the cover. Built in kickstand that lets you make hands-free video calls, read, or watch movies anywhere comfortably. Fashion Design : Elaborately fashion mirror design,makes your phone look special and gorgeous. Specially designed for people who loves the quality and value! Shinetop Mirror Case Series – Luxury Electroplate Plating Smart Clear View Window Flip cover For iPhone 7 4.7 inch. Elaborately fashion mirror design,makes your phone look special and gorgeous. You can use it to makeup everywhere. Made of Premium Synthetic Leather and Plating PC for long term durability. Simply open the case and your device will wake up,close the case then your device goes back to sleep.DON’T support quick call. Made of organic material, the whole case looks slim and wraps snugly around your phone, without adding much weight. 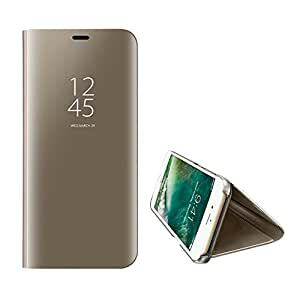 Both front and back sides with 360 degree full body protective phone case,effectively protects your phone against dust, dirt, bump and scratches. Compatible Model : ONLY For Apple iPhone 7 4.7 inch. We are committed to give our customers an excellent shopping experience.If you have any question about our products or service, just contact us, we will be always here for you. Thanks!